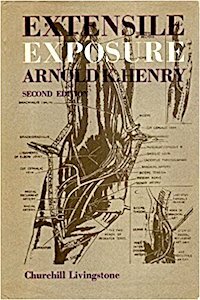 "Extensile Exposure" is a surgical classic -- it is famous for what a reviewer described as its "use of the English language and its literature to present cold fact with such warmth and life". It has been unavailable for some time, but is now available as a facsimile of the second edition with the addition of a short bibliographical note by Arnold K. Henry himself. An exposure is the route by which the surgeon gains access to the structures on which he or she wishes to operate, and the exposures can be extended if necessary (hence the term "extensile exposures"). Many of the exposures described in this book are still in use, but it will mainly be obtained for the literary pleasure of reading. As it has been out of print for some time, many surgeons will be pleased to have the opportunity of adding this famous work to their libraries. The Lancet: "There is no pleasanter way of revising anatomy". British Medical Journal: "The distinguished author is to be congratulated on this further development of a masterpiece". Many thanks to Digital Media Group again for making the scan possible.